Landscape Arch, Arches National Park. Photo by Jeremy Gleason. 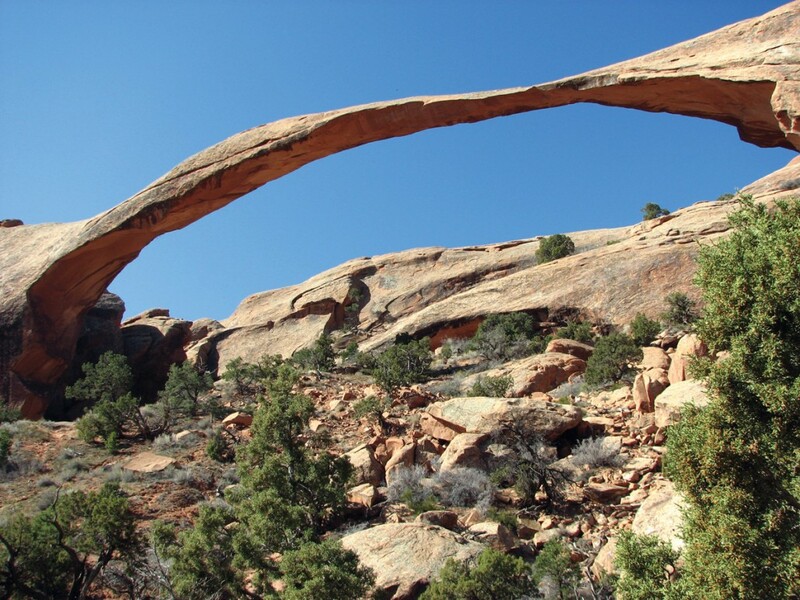 In the May 2009 issue of Survey Notes, we reported that Landscape Arch in Arches National Park was the natural arch with the largest measured span in the world. This was based on the work of the Natural Arch and Bridge Society (NABS), a small group dedicated to finding, measuring, and classifying natural arches (www.naturalarches.org). However, there are always obscure parts of the world where a larger arch could hide. Only about a year after NABS posted official measurements of Utah’s Landscape and Kolob Arches, a NABS group traveled into an area of rugged karst topography in southeast China. There, they measured two exceptionally large bridges formed by the dissolution and undercutting of limestone (karsting). Both of these are massive structures deep in the rugged Guangxi Province of southeast China. Fairy Bridge has an incredible span of 400 feet. Jiangzhou Immortal Bridge is less accurately measured at 280 to 340 feet, relegating Landscape Arch to 2ndor 3rd place—for now. Other behemoths could remain hidden in some side canyon of this rugged terrain. Though Landscape Arch doesn’t have the longest measured span of any type of natural arch, it holds the record for sandstone arches and for “arc-type” arches, and with its thin ribbon of gravity-defying sandstone, many would agree that it is the most awe-inspiring arch in the world. The May 2009 article generated questions regarding the definitions of “arch” and “bridge.” Some people view “arches” and “bridges” as two separate kinds of features. However, NABS, the only organization that I know of that deals with such matters in a scientifically rigorous way, states that a natural bridge is a type of natural arch, and that when comparing span length, bridges are included with all other types of natural arches. Top Fourteen Arches in the World 2012 (from Natural Arch and Bridge Society website at www.naturalarches.org). NABS now recognizes 14 arches with spans over 200 feet. Expect this list to change again as searches continue.